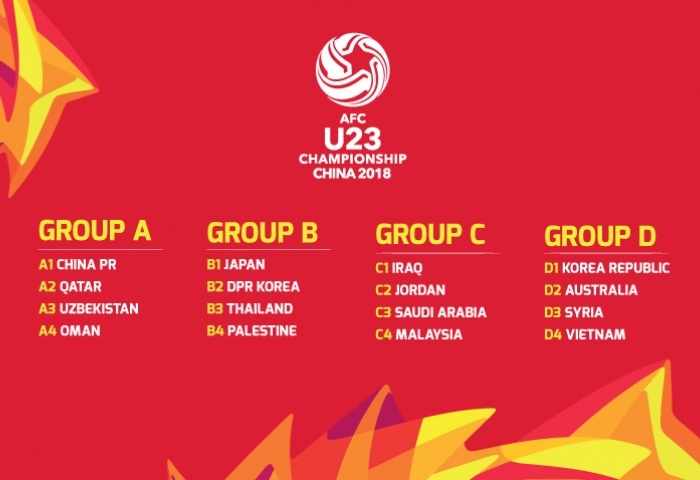 The Asian Football Confederation's draw for the finals of the 2018 AFC U23 Championship was held today in Changzhou. 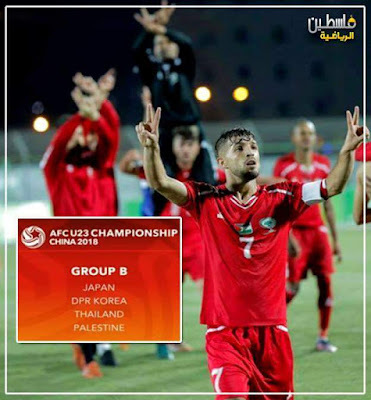 Based on previous performances, Palestine was placed in Pot 4- eliminating the possibility of being drawn with fellow debutants Malaysia, Vietnam, and Oman. On paper, Palestine can be happy with the outcome of the draw. 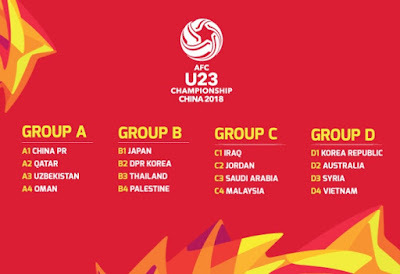 Thailand was the first team grouped with them and they are, based on previous participations, weaker than the other Pot 3 teams- Syria, Uzbekistan, and Saudi Arabia. Korea DPR were the team out of Pot 2 and the group was rounded out by reigning champions Japan. Palestine: Group E Winners. A commanding performance in their opening game against Tajikistan was foiled by defensive errors forcing Al-Fida'i to settle for a 2-2 draw. As a result, the team was left with a must-win scenario against cross-river rivals Jordan. A discombobulated first 20 minutes left them down 2-0 but bolstered by a heavy dose of emotion the team clawed back to achieve a 3-2 victory. The team rounded out qualifying by dispatching of Bangladesh by a 3-0 scoreline. Thailand: Group H Runners Up. The War Elephants hosted their qualifying group and failed to convince for long stretches over the three game qualification phase. A 3-0 win over eventual group winners Malaysia was sandwiched in between a 1-1 draw vs. Mongolia and a dour scoreless affair with Indonesia. North Korea: Group G Winners. As always, the Chollima, represent something of an unknown quantity. They started qualifying by drawing Hong Kong 1-1 but blew past the hapless Chinese Taipei and Laos by a combine score of 13-1 to win the group with seven points. Previous Participations: (2- 2016, 2013) Amassed 4 points at the inaugural tournament in 2013 by beating Yemen (3-1) and holding UAE to a scoreless draw but lost 1-0 to Syria. Advanced out of the group stage in 2016 on a mere two points after a three way draw with Saudi Arabia and Thailand. Japan: Group J Runners Up. The Champions of the 2016 edition made easy work of their first two opponents, dispatching of Philippines by an 8-0 scoreline and then breaking down a stubborn Cambodia, to win 2-0, courtesy of two second half goals. The only blip came in their last game against China- a 2-1 loss meant they had to wait on other results to confirm their ability to mount a title defence. Previous Participations: (2- 2016, 2013) The Blue Samurai made it out of the group phase in 2013 and 2016 without losing a match (4 wins, two draws). In 2013 they fell at the quarterfinal stage to eventual champions, Iraq. In 2016 they beat Iran 3-0 in extra time, exacted revenge against Iraq, and scored three times in the final 22 minutes to beat Korea Republic 3-2 in the final. Palestine will open up against Japan before facing Korea DPR. They will close out the group phase against Thailand. The exact date, time, and location of the matches- due to be held in January- have yet to be revealed by the Asian Football Confederation.